We mentioned in the May issue of the Alien Times that the Tsukuba Information Center reopened as the Tsukuba Science Information Center in April. However, it was open only on weekdays. Well, this week, the City has announced that the Tsukuba Science Information Center is now open on weekends! It will be closed on Mondays and National holidays and during the year-end and New Year holidays instead. The place that we all know as “the Information Center” has been closed for a while, but it has restarted its operation as the “Tsukuba Science Information Center” in April…, tentatively. Tsukuba Science Information Center provides the kind of service and information the “Information Center” used to offer, such as the information area where visitors come and pick up brochures and newsletters. 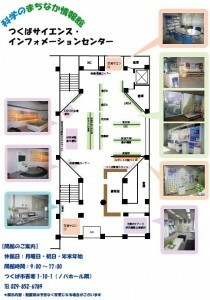 The Tsukuba Science City-related exhibit also continues. They are currently open only from 9:00am to 5:00pm, Monday thru Friday. I know their new hours are very inconvenient if you work during the day, but hours may change sometime since everything is “tentative.” Even the new name for the facility is tentative!